A site dedicated to the wonderful hobby of miniature wargaming and a pastime that keeps my soul young at heart and fresh of spirit always. All pictures and content copyrighted and may not be used or copied without the express permission of the author. We have been playing a fair few Chain of Command rules in recent years and all of us find them enormous fun. A great set of skirmish style rules which also allows for larger combats and most importantly, they are able to be played at they club on a Wednesday night to a conclusion with a box full of figures. Well a few of the members were seeking to use a few more of the models and figures we had all accumulated in the past years when we were still playing Kampfgruppe Normandy, the wonderful rules from Warwick Kinrade which we all absolutely adored at the time. Then the closing down of Warhammer Historical stuffed everything up.. Soon after Battle Group Kursk was published. However, though we all bought the rules, we certainly ventured into other rules and other periods. Battle Group sat collecting dust on the shelves. Until recently. Martin and Phil had been chatting for a while about getting the game moving again so that the actual Battle Groups we had painted up and modelled could be used again in full. Martin and I decided to be the first cabs off the rank and play a game at his place set in 1944 France. So we decided on a 500 points a side battle between US Airborne troops and German defenders. One of the great aspects of the Battle Group rules is the options to have support sections such as armour, engineers etc. to assist. It makes for a fun game with plenty of diverse looking models on the table. Whilst some German Recce vehicles make their way down the road. A Pak40 in tow looks to position. offer a second chance again so soon into this particular engagement. up the visibility rules by the way but it was the same for both sides. BANG! Success for the allies and disappointment for our German friends. Whilst a Forward Observer team and squad arrives at their objective point. The Pak40 turns to see if it can find some attractive targets. ...some Shermans looking for a fight...against weaker and tiny armoured German vehicles. Certainly not against some Panzer IV's that's for sure. US mortar fire manages to pin and suppress the German gun. The Shermans advance fails to even scare the local cows! However this M10 Wolverine may attract a few more panicked Teutonic stares. deliver a knock out blow to any of the armoured assets. As well as some troopers carrying Bazooka looking to deploy. It was at this stage where the allies luck really kicked in. Outgunned by the German armour, the allies attempted to close the distance between themselves and their deadly opponents. 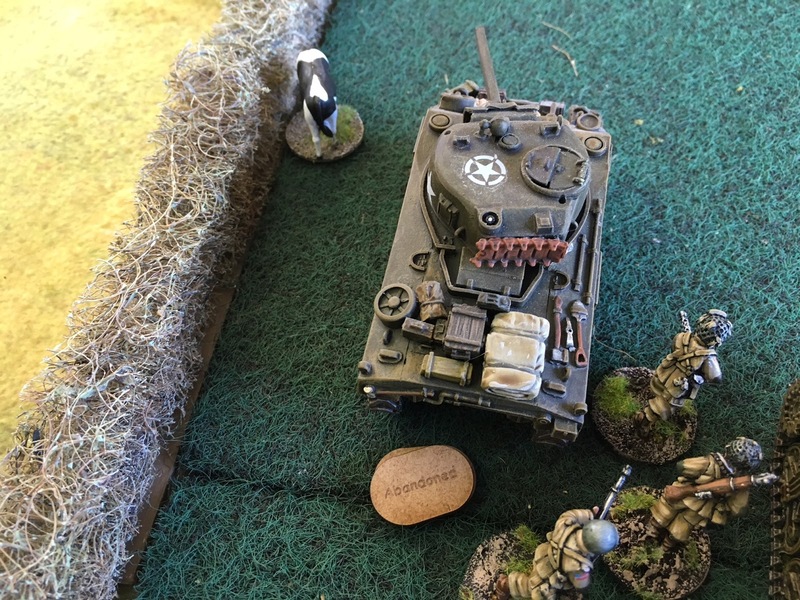 Martin, playing the Germans, was hopeless in his potting and observation attempts and failed on numerous occasions to get the correct dice to blow the Sherman's to kingdom come. and Wolverine to take a match winning position. Beautiful scratch built garden from young Martin. Well done mate! The German 222 goes up in flames and the end is nigh. A German MG42 team try and stem the tide but it is too little too late. At this point the morale and will to resist from the German defenders fell away and the battle was won by the US Airborne troops. A great fun game and one which I am sure we will look to play again soon. Thanks to Martin for hosting the game in fine style as always. So much of the terrain was either scratch built by him, including the roads, gardens, hedgerows etc. Great looking tables are always a joy to play on and this was as good as any. Thanks this really goog ARR. lovely pictures of very good modens, figures and terrain ! We love the Martin's garden with the cat that give the reality touch ! Thanks L - greatly appreciated. Thank you very much Ray. It is nice to be able to get some more vehicles out and have a nice rumble on occasion isn't it? Very envious,looked like a great day.Just started to get a few lads at the club to think about Bolt Action. Will make a change from Sword Point!! Thank you D - I never really got into Bolt Action I have to confess as I liked the mechanics of Chain of Command far more. We really enjoyed KGN (Kampfgruppe) and this is the next rendition of it. Lots of fun. very nicely done, I have the rules but have never played as like you we do CoC. But I ill have a look. Thank you for that. I would highly recommend it as it is a good deal of fun and a game where the carnage can be huge in terms of vehicles disabled once you manage to spot them. And lovely neat terrain... a man after my own heart... just because it’s WW2 doesn’t mean it has to be messy. Cheers Aly and I will certainly pass on your kind comments to Marty who put the table together. I hadn't had that troop of Sherman's out for years so it was wonderful to get them onto the board and into such an attractive looking wargame. Very nice compact game beautifully delivered on the table top. Looks great fun! Well done to Martin and yourself Carlo! Thank you very much Kevin and your comments on a nice compact game are absolutely spot on. Like yourself, I do enjoy the "Grand games" however this proves you can have just as much fun on an 8 x 6! Great looking game, lovely scenery and figures with lots of nice details! Thanks Iain - it was a lovely game to play in that’s for sure. Magnificent table and troops, Carlo! I do like a good WWII table and game. Though I am unfamiliar with these rules. Nice pictures. Thank you very much indeed Kerry. Greatly appreciated as always. Impetus Rematch - Those "Pesky Persians" rise up again! Von Peter Himself - a star! !